Make a final effort and pass the exam successfully! Spring is coming, even here in Finland! For current students, it means that the academic year is close to a finish line. However, the applicants all over the world are trying to make the final preparations before the period of April 1st -11th 2017. During these dates, the entrance examinations in different countries take place. This information is really relevant now, that is why I have decided to take the baton and follow the topic started by Iuliia in the previous blog post. Dear students applying for the IB program, you are really lucky ones. 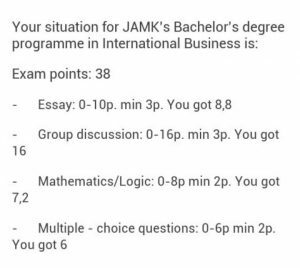 Both Iuliia and I are studying International Business here at JAMK, so you can get double portion of information related to the entrance exams for this program. As it goes to logistics and nursing, unfortunately, we are not the right people to ask for any tips, sorry. During the preparation process I assumed my readiness to be quite successful. I felt familiar with the pre-reading materials as I went through them inside out hundreds of times. Maths and logic seemed to be a piece of cake to compare with ones that I learnt at school. Group discussion left controversial feelings, but still I was pretty much confident about it. Thanks God and the school where I was preparing, that they offered us to take part in a kind of sample exam to test ourselves. This «rehearsal» took place 2 weeks before the real exam date. The results definitely brought me back to the Earth. Looking at the paper I realized that my overall score was not enough to enter any university from my list, not mentioning JAMK itself! To say that I was shocked would be to say nothing. 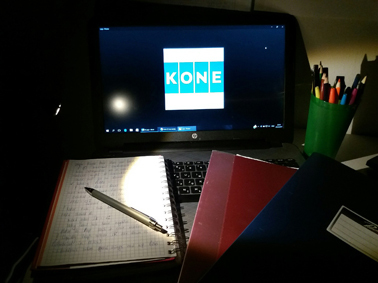 After a while, the mess in my head calmed down and I decided to organize for myself a two-week mind blowing preparation session. Every single day I spent hours to revise everything, to touch the sides that we haven’t worked out very deeply in the classes, I literally lived and slept with those thick material cases. On the actual written exam I felt rather confident. 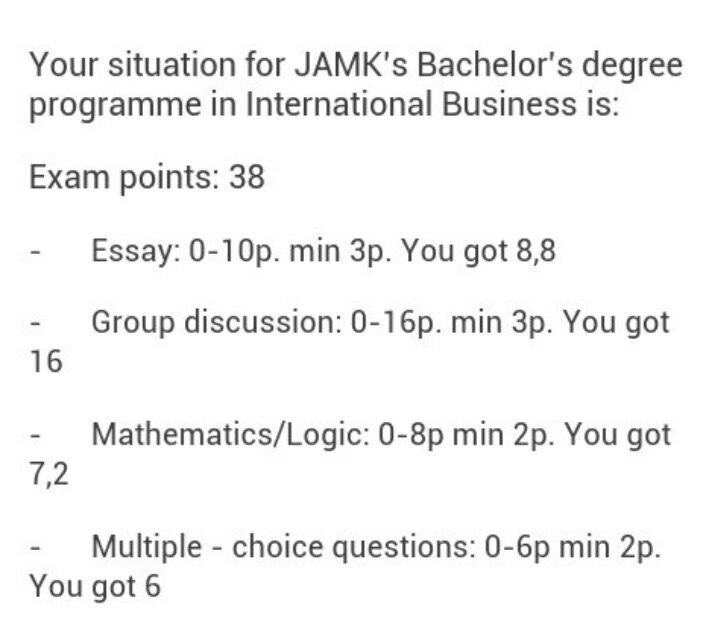 I easily completed the maths/logic part. The multiple choice was not complicated for me. I managed to remember the view of the lines that contained one or another piece of information which was necessary for answering the questions. In spite of unexpected topic of the essay, it did not seem to be extremely difficult for me, as my teacher made a strong emphasis on that aspect. The only issue, that I was worry about, was the time scarcity. I was writing the last lines of my essay in the way to the examiner’s table. Luckily, my place was on the last row of the huge class, so it somehow allowed me to have a benefit of 2 extra minutes for writing. The atmosphere before the group discussion part was so tense. Some people were pacing from corner to corner trying to hastily revise some topics. Others were sharing their impressions about the written part, not inspiring confidents to each other. Guys from the first groups started going out of the classrooms. The faces expressed different emotions from the total happiness to the universal sorrow. However, there was a talk that the topics of discussions are really theoretically based, for example «The main methods of team building». When I went in the classroom and turned over the paper with the topic, my eyes became like tennis balls. For 5 minutes, given for creating some key points in your head, I have been trying to understand the topic and guess what we were expected to say. In the last seconds of preparation time, I looked around and found out that no one knew what to talk about. Finally, one guy broke the silence and made an introduction, rephrasing the given topic. At that moment, I realized that I would get zero if I did not open my mouth. The hopelessness of that situation led me to the strong decision: «Now or never»! I started telling everything that appeared in my mind and more or less related to the topic. Leaving the class, I forgot to take my bag, so I knocked on the door and came. The examiner was counting our points. She caught my curious glimpse and cover the sheet by her hand. So, being sure that the exam was failed, I opened my umbrella, stepped out on the street and trudged home. One and a half month later I got a notification about my acceptance (this story you can find in my previous blog). I did not believe when I saw my points! 16 out of 16 for the group discussion! I was really proud of myself. What I would say, summing up my story, that no one expects you to be a professional in any sphere at the entrance exam. The main thing is to show how versatile person you are, how much potential you have. Good luck everyone! Don’t be afraid and do your best!